"Racing at the ECTA event in Wilmington, Ohio went really well. My family (wife Jill, 2 daughters and my dad) and I drove down on Friday. Gene Dlask towed my bike and gear down on Thursday. He also brought Bonneville 200 mph Club member and long time friend of S&S Warner Riley with him. Gene and Warner got my bike through tech on Friday while I was driving down. On Saturday morning, we were ready to run. I made 5 runs and worked my way up from 141 to 145 mph even though there was a stiff 15-25 mph headwind. I only had about 101 hp to work with and an open bike (no fairing) so I was reasonably happy with the first day’s results. Gene made 3 runs. The first one on his turbo ZX14 was 199 mph. The wind was “exciting” enough that he parked it until later in the day when the wind was a little better. He was able to make a 207 and 208 pass. These runs were good enough for both of us to set records in our classes. So at the end of the day, Gene was presented with a Wilmington Ohio 200 mph Club hat and shirt! On Sunday morning we made another gearing and jetting change to my 1350cc bike and expected less wind. We were close to the front of the line and ready to run at 8 am. I made a nice 147.9 mph run. Gene made 210 mph pass a couple riders after me. We were both feeling really good and ready to keep making changes and going faster. After learning what had happened, Gene and I decided to pack up and head home. They said they would resume racing when the crash investigation was complete, but we didn’t really feel like running anymore and didn’t expect that they would rush the investigation to get the racing back underway. I fully believe that my 1999 Buell X1 with a 1350cc S&S engine is a 150 mph bike with a little more tuning. I came home with an A-PG 1350cc record in the ECTA organization. I will run it again sometime, but in the near term, my focus is now turning to my 1995 Buell S2 with a 3000cc engine and a fairing. Again, the goal is to head to Bonneville this fall prepared to run over 200. 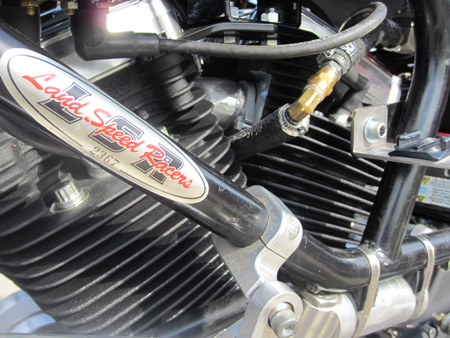 My engine is a 3-5/8 +.040” bore x 3-13/16” stock stroke S&S engine built on 3-5/8” bore Super Stock cases. The cylinders and heads are pretty much stock other than some angle work on the valves. Other than the overbore to get to 1350cc, this is S&S’s 79” Hot Setup kit with 92-1130 series pistons with 11.3:1 compression. I used a G carb, stock Buell header and a custom muffler to make between 101-105 hp. I want to thank Dave Miller from Spectro Oil for his support and Tom “Santa Clause” Anderson from the Buell Brother’s Race team from the front fender. " Congratulations to you Jeff and we love having the S&S family carve their names in the record books. 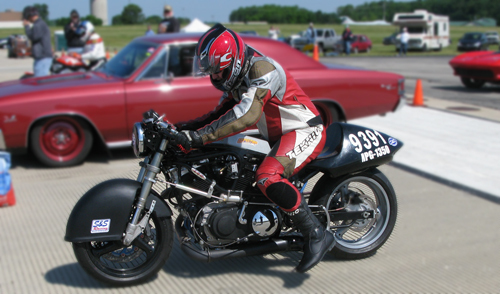 This was a great way to prep for his upcoming runs at the BUB speed trials in Bonneville this August.